Synonymous with Hollywood glamour, hair extensions have come a long way since the days of unrealistic clip-ons and glues galore. Nowadays, many a glorious mane can credit hair extensions with creating their luscious look; it’s incredible how transformational they can be, elevating even the most straightforward styles. Looking after hair extensions is vital; their longevity depends on you sticking to a strict aftercare regime. Figuring out how to care for your hair extensions can be confusing; however, at Rush, we believe in people confidently caring for their hair, extensions and all. So, whether new to hair extensions or having used them in the past, it’s essential you know how to properly maintain your set. We’ve put together a handy guide on what you need to brush up on when it comes to keeping your hair extensions in perfect condition. It’s a journey ensuring your hair extensions stay in the best condition possible; they should always look full and healthy while you’re wearing them. You may be using hair extensions to enhance the hairstyle that’s best suited to your face shape; if this is the case, caring for them is even more crucial. Sometimes, it can feel like caring for your hair extensions is a full-time job, but with the right aftercare regime, it doesn’t have to be such a hassle; here are some things you should know to make maintaining your hair extensions that much easier. • Brush first to remove any tangles; although brushing your hair before you wash it may seem strange at first, we promise it’ll keep your hair extensions looking fuller for longer. • When you wash your hair, make sure the shower water flows in the direction your hair grows. Also, don’t wash your hair over the bath or with your head upside down; this can cause tangling and prevent any haircare products from being rinsed away. • Apply shampoo; with more hair than usual, you’ll need to use considerably more than you’re used to. Lathering thoroughly and quickly splashing your head under the water at frequent intervals will help evenly spread the shampoo throughout the hair. Stroke don’t scrub and be careful not to disturb the bonds of your hair extensions too much when washing your scalp. • Rinse as normal, giving your hair plenty of attention; one of the most common causes of itchy hair extensions is leftover shampoo or conditioner due to inadequate rinsing. • Squeeze and pat your hair extensions to dry; do this instead of wrapping your hair up in a towel, which only puts unnecessary pressure on the extensions and the roots. If you plan on using conditioner on your hair extensions, do so after shampooing; apply to the mid-lengths and ends only – conditioning the scalp or roots can cause hair extensions to slip or loosen. Leave for a few minutes before letting it soak in as much as possible. Afterwards, rinse thoroughly and squeeze to draw out any excess water. • Brush every morning; it stops the roots and bonds tangling while simultaneously taming the hair from the mid-lengths to the ends. • As we mentioned above, brush before you wash! This will make it easier to brush your hair extensions when they’re wet and keep tangles at bay. • Be patient when you brush your wet hair extensions; go slow to effectively detangle. Brushing in long strokes from root to tip is a sure-fire way to tighten any tangles in your hair, making them even more difficult to remove. • Brush before bed; brushing one last time gets rid of any stubborn tangles that may be lingering in your hair. If you don’t get rid of them in the evening, you’ll have to deal with them when you wake up and let’s face it, nobody wants that. • Always keep a brush with you; seriously, you never know when it’ll come in handy, particularly if it’s wet or windy outside. Before you go to sleep, ensure your hair extensions are secure. This way, styling the next day will be a lot easier and you won’t have to worry about detangling, which can put pressure on the bonds of your hair extensions. This also comes in handy if you share a bed; securing your hair extensions stops them pulling or becoming trapped during the night. Whatever you do, never fall asleep with damp hair extensions in! If you do, your hair will be very difficult to brush the next day, straining and potentially damaging the bonds of your hair extensions as well as your natural cuticles. • While wearing hair extensions on holiday, be careful of the water you expose them to; high amounts of chlorine in swimming pools can cause brittleness to your hair extensions, while minerals in the sea and shower water can, in extreme cases, cause discolouration. • Supply moisture to your hair extensions with regular intensive treatments; they receive no natural oils from the scalp to keep them strong and healthy. Using oil-based products, preferably the natural kinds, will help achieve this. • Arrange regular maintenance appointments with specialists you trust. Check-ups every 4-6 weeks are recommended so your hair extensions stay healthy and look fantastic. If you have any questions about hair extensions or how to properly care for them, contact our friendly teams for a FREE consultation. 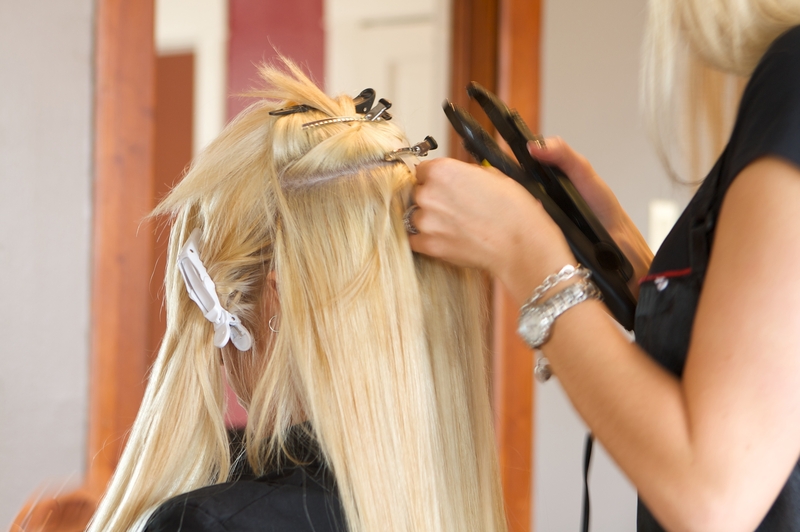 Find a Rush salon near you to start properly getting to grips with caring for your hair extensions.